In the wheat fields and cattle ranches of Sonora, Mexico, we can find culinary history that is a major influence in Tex-Mex cuisine today. In Sonora, wheat flour tortillas and traditional Mexican Machaca come together to make burritas. They are an everyday type of taco there. 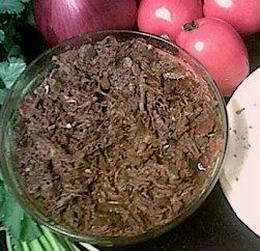 Machaca in its traditional form is the Mexican equivalent of beef jerky. It is basically beef that has been marinated, cooked, shredded and dried. The drying process preserved the beef, made it easy to pack on the trail, and it also gave the machaca a unique texture when prepared in the traditional fashion. In Tex-Mex cuisine, an adapted version of the traditional machaca is a staple that can be served alone with tortillas and taco fixings, or as the basis for many other dishes. Many people still call it machaca, yet it also shows up on menus as shredded beef. The main difference being that the beef is not dried after cooking. There are many subtle differences in how it is prepared from recipe to recipe. Much like meatloaf, it is hard to find two recipes exactly alike. Machaca is a great example of cooking with one of my favorite cooking techniques called braising. Braised dishes use a combination of cooking methods. You start with a high heat sear to develop flavor and add texture and color, then add moisture and reduce heat to a low simmer. The long slow simmer breaks down connective tissues and fats, resulting in a very tender, moist and flavorful product when its all said and done. I put Machaca in the category of chili. When the weather outside is right, I like to make a batch of it so that I have plenty to freeze and use when I dont have time to cook. Its great for tacos, burritos, chimichangas, enchiladas, quesadillas, taquitos, chili rellenos, and any recipe that calls for taco meat. In my opinion, machaca is so superior in flavor and texture to ground beef taco meat that it makes me wonder why anyone would use ground beef for tacos. It is also very easy to make. So, leave the ground beef tacos to your local fast food joint, and make a batch of machaca for your favorite Tex-Mex dishes. This is a basic machaca recipe. You can add to it or take away from it. Spice it up a little by adding chili powder or chili paste. Finish with some diced potatoes for Machaca con papas. You could also make a version of this recipe with leftover roasts or fajitas. Skip the marinade step and the searing step. Simply simmer the meat with the other ingredients until it is falling apart then shred it. 2-3 lb Chuck Roast or Skirt Steak, trimmed and cut into lb portions. For the marinade, combine all the ingredients in a bowl then whisk them to form an emulsion. Add the beef making sure every piece is evenly coated. Cover and refrigerate. Marinate the beef overnight in a bowl in the refrigerator. Before preparing, drain thoroughly and allow meat to come up to room temperature for about 30 minutes. In a large soup pot, heat a few tablespoons of oil over medium-high heat until very hot. Sear the beef a few pieces at a time to develop a rich brown color on all sides as well as on the bottom of the pan. Do this in several batches if the pot is too crowded. When all the beef is browned nicely and removed from the pan, add the onions, peppers, and garlic to the hot pan. Saut for a few minutes then add the remaining ingredients to the pan along with the beef. Bring to a boil, scraping the browned bits off the bottom of the pan. Reduce heat to low, cover and simmer slowly for about 2 hours. The meat should be very tender and should easily fall apart when pricked with a fork. Remove from heat, remove meat to a cutting board and shred with a pair of forks. Return to the pot and bring to a simmer, uncovered. Reduce the liquid until very thick, almost dry. At this point, adjust the seasoning with salt, pepper, and whatever additional heat you want to add if any. Serve with tortillas, cheese, salsa, lettuce and guacamole for a great beef taco. Portion and freeze the remaining machaca in zip lock bags for later use. One of my favorite things to do with machaca is make enchiladas. Once you have the machaca, its really easy. I like a fairly hot sauce with this, so I make a nice sauce out of chipotle peppers, canned diced tomatoes, and beef broth. Its easy to make your own sauce, but if you are in a pinch for time you can also buy canned sauce from the store. Heat the oil in skillet over medium high heat (or in your deep fryer at 350degF). Quickly fry the corn tortillas one at a time by submerging in the hot oil just until soft, about 5 seconds. Tongs work great for this. If you cook them too long, they start to get crisp and this is not what you want. You want them to be a little soggy from the oil. Drain on a paper towel lined plate. Do this to all the tortillas. This does two things. It makes the tortilla soft, and it gives a nice texture to the exposed ends of the tortillas after baked. For those that are worried about fat intake, you can also achieve a similar result by dipping the corn tortillas in boiling chicken broth for a few moments. This will moisten and soften the tortillas. But seriously, try the oil. You will use less fat then what is in a typical serving of salad dressing. When the tortillas are cool enough to handle, fill and roll each with about 2 ½ tablespoons of machaca. Roll tightly. Place the enchiladas side by side in the pan, seam side down. Cover across the middle with the chipotle sauce and top with the cheese. Bake at 350degF until the cheese is melted, the sauce is simmering and the enchiladas are heated through, about 20-25 minutes. Allow to rest for about 5 minutes before serving. Serve with Spanish rice and pinto beans or refried beans. Heat the oil in a pot over medium-high heat and saut the onions until soft. Add remaining ingredients and bring to a boil. Cook for about 20 minutes. Place the sauce in a blender and blend until smooth. Check the thickness of the sauce. It should be the consistency of gravy. If the sauce is too thin, return to a simmer and reduce to desired thickness. If it is too thick, add more stock to thin it out a little. Once you have the right consistency, adjust the seasoning with salt and pepper. Still have some machaca? Well, try a quesadilla made with 2 flour tortillas, 1/4cup grated cheddar cheese and about 2 tablespoons of machaca. Cook like a grilled cheese sandwich in a skillet over medium high heat until the tortilla is golden brown and crispy and the cheese is melted through. Serve with a dollop of sour cream and your favorite salsa. Enjoy!